QUESTION: Are there any sword canes out there that would be worth buying for use? Absolutely no offence to you Phil, but all i want to say about Burger knives is, they have this "all components (i assume incl. blade) are 303 stainless steel" statement, and we've got a problem here. 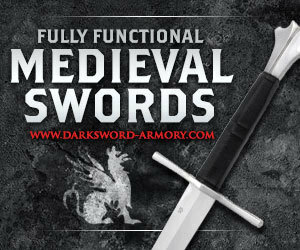 Because stainless steel has stood the test of time--of being one of the worse things materials you can use to make swords. Check well before you buy any, they're illegal in most countries. Recently I was at a weapons store, and I asked the storekeeper how much the sword canes in the Cold Steel catalogue cost, and he told me that if he sold them, I bought them or if anyone had them in their possesion, they'd be in violation with the law. I don't know about where you live, but be careful before purchasing. I have a sword cane.....made by Windlass.....an indian knife/sword maker. i bought mine from atlanta cutlery catelog. It it the straight knob head design with a carbon steel rapier blade that is about a blade length of about 28 inches. Its all black matte finish. I have used this one allot....and it is sturdy...and well designed. The whole thing is made of steel....including the botton haft. it has a locking mechanism and you have to push a button to release it. I have owned his product for years and it has held up well. 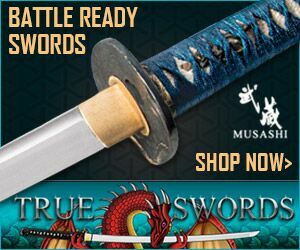 I would recomend this product....as i am a sword collector and can tell a quality product from a crappy one. Burger Sword canes have stainless steel 303 fittings. The blade is made of high carbon steel (Austrian 440c for the MKII canes). Just taking a look at their website, you can see that these are not over-priced. 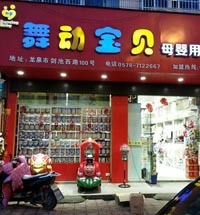 They are a quality item. I would call before ordering to see what steel the MKIII blades are made of; however I'd be surprised if it's not the same 440c. I have owned 3 Burger sword canes and I can tell you that the blades are not 303 stainless steel the fittings are, the blades are 440c or high carbon steel for the lower priced model. 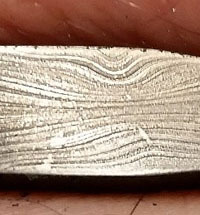 The high end is Damasteel mine was Odin's eye pattern. I am disabled and use a cane daily these will support my 300lbs with no problem. To bad they are not legal where I live some states if you have a weapons permit you can carry them. 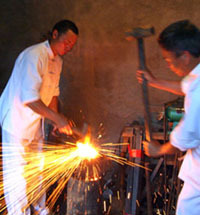 The blades are fully heat treated and are fully functional weapons. They blow the Cold steel away, the Cold steel sword cane I had I tried to puncture a stack of magazines and the blade bent and stayed bent. The Burger blade flexes and returns to true like a sword should. There is no better sword cane made the Burger is the best you can get. "The double sided hollow ground blade found on our Mark 2, 3 and 4 models is made of 440c martensitic chromium steel. Highly corrosion resistant, this Austrian steel is hand ground into a double sided blade 5mm (3/16") thick and 14mm (9/16") wide, tapering to a needle sharp point. After hardening and tempering, the blade is polished and sharpened on both edges." As a general rule any knife or sword coming from these companies are cheap. They can crack at the joint, under pressure and will not hold and edge. 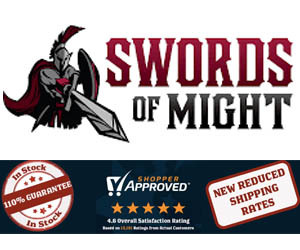 You have to pay for a high quality knife or sword. 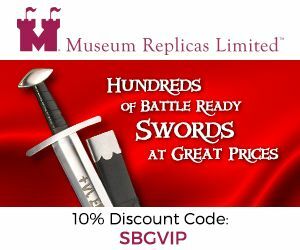 There are swords that are up for auction that are better than any made today. These were made in the 1700's. Back then a sword was your only means of defense. If, in battle, your sword could break or shatter an opponents sword. You just won, unless the dude could run really fast. 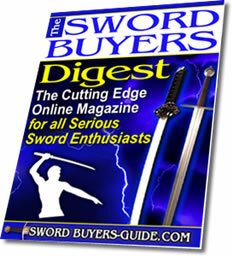 Save up your money, buy one great edged weapon. You hopefully will never have to use it. But if you do, you want to be the winner. i also have a cane sword with a part ivory handle and india on the top of the blade; it looks old, but whats it worth? I have 2 of the cold steel sword canes. I have the Heavy Duty model and the stainless steel knob handle model. The Heavy Duty is a very nice STURDY cane with a blade that is extremely sharp & does seem to hold it's edge. The knob handle is a nice balanced cane with a fencing style blade. (no cutting edge, just sticking) The blade on the heavy duty would be more useful in most situations. There is a cane maker in Ohio called Boris Palatnik that makes a cane that is said to be better than Burger because of blade quality (tempered steel & Damascus) and general craftsmanship. I have seen pictures and they are very nice, but also expensive. Most of us have to stay with cold steel, a reasonable price and good quality though not the best. 440 stainless, like that used in the low end burger models is just not good steel for a sword. i personally would avoid anything not made of 1050 or higher carbon steel (spring tempered) or better material. 440 stainless is great for small knives, but a sword of same will likely shatter or break under the stress of any real use. Reproduction “Victorian-era” sword cane probably made in India in the 1960‘s - 70‘s. Unsharpened blade has "India" on it. Is it illegal to sell? How much is it worth? Hello! I have a very interesting sword cane that is a darker finish, bamboo body. the blade is a foil blade marked "Fabrica De Toledo' im really interested in seeing how old this cane is and what its story is. ?KJZ EN TOLODO on the other. I took it to a local auction house and they thought it was 200 years old.Any further info? Have been sorting out my mother's possessions and have come across a sword stick with a Lion's head on the top and ivory looking inlay. The sword part condition is ok but could do with a clean. The wood holding part is a bit scratched but nothing major. I wonder if anyone has advise on selling this item as it is just sitting here and it would be lovely if someone bought it and restored it. i am interested in buying the sword cane, tell me your price. Hello if anyone has any sword sticks, they would like to sell please contact me with some picstures at jonnykerry@hotmail.co.uk. Does anyone know of a supplier for the Windlass Stiletto canes? Atlanta Cutlery has discontinued them and I would really love to buy one. If anyone has one they are considering selling, please drop me an email at terry.stilettocane@nyms.net. i was looking at your site because i own some sword canes and i saw a comment by anonymous, ,that simply stated " go f--- yourself...my question is, why would someone do that ? it degrades the sender, far more than it offends the readers...i like your site but, can't you screen out those comments ? can anyone tell me how much its worth ? I also have a sword cane that I just picked up. I has an ivory (or bone) portion on the handle of the sword. 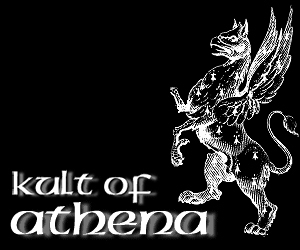 the top is a brass lions head. the blade is about 24" and has "INDIA" engraved (dot matrix) on the top of the blade. duck head sword cane . THOMASCAMBRON 89@YAHOO.COM ANYONE NO ANY INFO ON THIS ARE VALUE ? 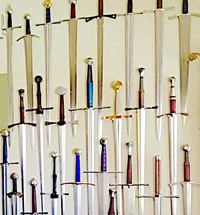 That depends on which type of sword cane you are looking for, as there are many different types. About 4 months ago, I purchased a Japanese sword cane on ebay for about $230. 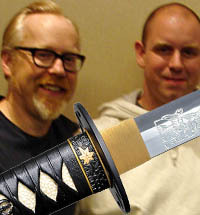 The sword I bought, known as a Chokutō, and was forged from 1095 carbon steel, and has a genuine hamon. It is mounted in rosewood Shirasaya. So yes, there are good deals out there, you just need to spend a good amount of time looking for exactly what you want. I have a cane dagger handle made of ivory with a serpent and grape vine cared on it. The dagger blade is 11 1/2 inche long and the handle is 3 inches. All I know is it was found hidden in the lid of an antique leather sea trunk my parents purchased in the late 40's. Can you give me some idea what it might be worth? Is there a value for the cane sword with the molded/carved brass Kukris lion head? I know somebody in Arizona, who makes vary nice ones using French bayonets. I have studied the Burger site and looked up the terms. The 440c steel they use is stainless. Even the Damascus Odinseye they use on the expensive models is referred to as "Stainless Damascus" Considering that these canes run from around five hundred to around sixteen hundred, I think you should be able to get one made with an incredible custom blade for that price. I’ve seen some sword canes which have pretty good blades—if you think about, if you’re really using one for self defense as apposed to, say, beating on rubber tires all day—the blade doesn’t have to be all that great—but not a one of them looks any good, at least to me. Most are much thicker than an actual cane; and they rattle terribly! Solution: I’ve made my own! The blade of one was just a steel dowel which I ground down like a giant ice pick, and the other from an old, broken rapier blade. Both were narrow enough so that the scabbards looked no larger than a regular cane. So, you could always make your own. But remember: In all US States, Sword canes are concealed weapons and so illegal. A concealed weapons permit is for firearms not swords. And even if it were legal in your state, that doesn’t mean it’s legal in your city or town, so be careful. I have 3 sword canes that belonged to my Dad. Don’t see any markings. Where can I get their value? 3 sizes somewhat ornate. Thanks. There are some states that a concealed sword cane are legal along with switch blades and other knives of that nature.